When we first started our weaning journey over a year ago, I chose the baby led route because I wanted meal times to be easy. The idea of handing over a pear or slice of bread, moving on to chicken drumsticks and eventually plates of the exact same food we were eating as adults appealed as a simple option and seemed like the best way to avoid fussy eating or multiple meal making. 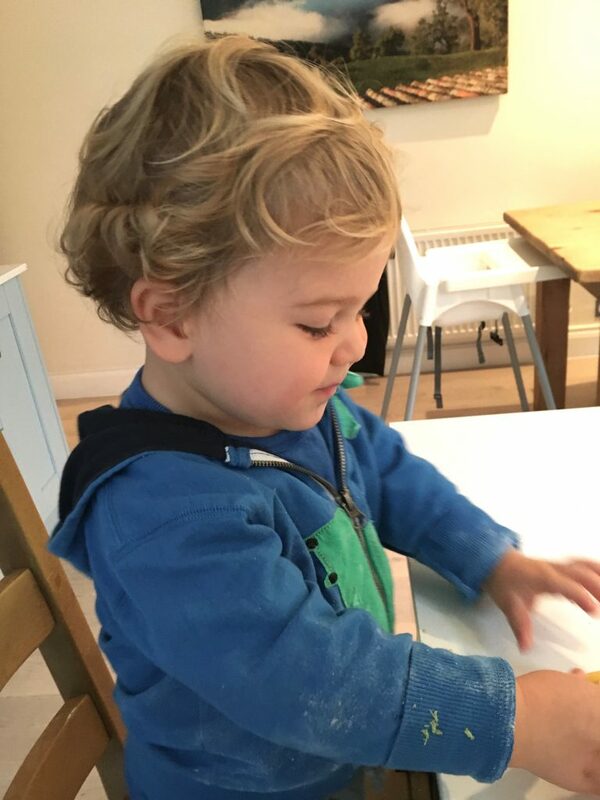 To a large extent I’d say it’s been a success – Nino’s a hearty little eater, loves his veg and asks to try almost anything in sight – but I’d be lying if I said it was plain sailing over here. There are days when foods are rejected, forced on whichever unfortunate soft toy he’s lined up as a mealtime companion or thrown on the floor. Like any normal mother, I often cook the things I know Nino will like, especially if it’s someone other than me feeding him. And although he’s pretty handy with plastic cutlery nowadays, he’ll still insist that I spoon food into his mouth or ask me to cut something that could easily be bitten in two on a pretty regular basis. Another thing I didn’t factor into my plans of baby led brilliance was that we won’t always be able to eat the same things. Yes it’s great to be able to make fishcakes for the whole family, portion off some pasta or share a roast, but we’re also partial to plenty of things my toddler isn’t so keen on (or I’m not so keen on for him) – salty soy marinades, super spicy curries, crunchy greens, that sort of thing. 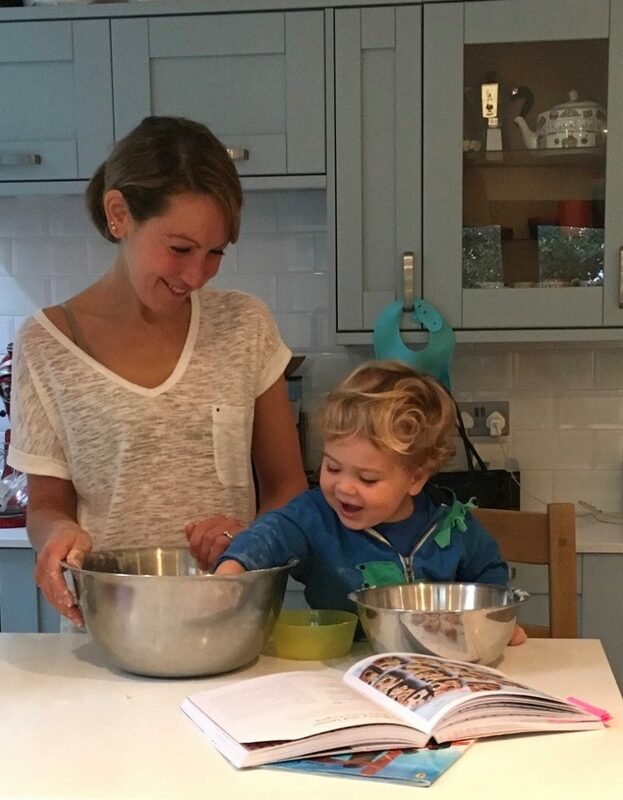 As Nino gets older, I’ve been trying to better plan meals with all the family in mind, and Vanessa Clarkson’s beautiful new book is a brilliant guide to bridging the gap between toddler food and the kind of meals we would all be happy to eat. I would say that Real Food for Babies and Toddlers is a great new addition to my bookshelf, but it’s barely left the kitchen counter since it arrived a few weeks ago. 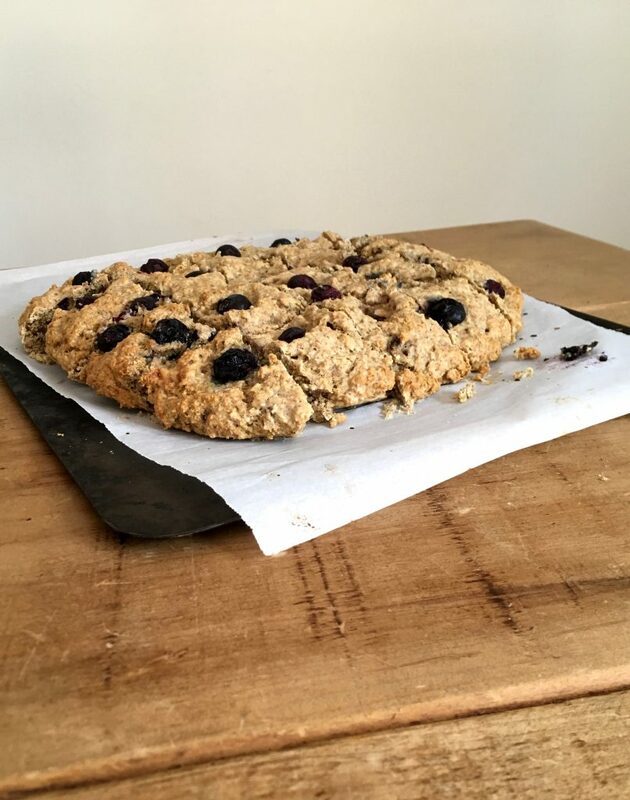 To date we’ve made fish parcels and fingers, spelt pastry for pies, lemony buckwheat risotto, frozen berry labneh cups and these naturally sweetened blueberry and yoghurt scones. 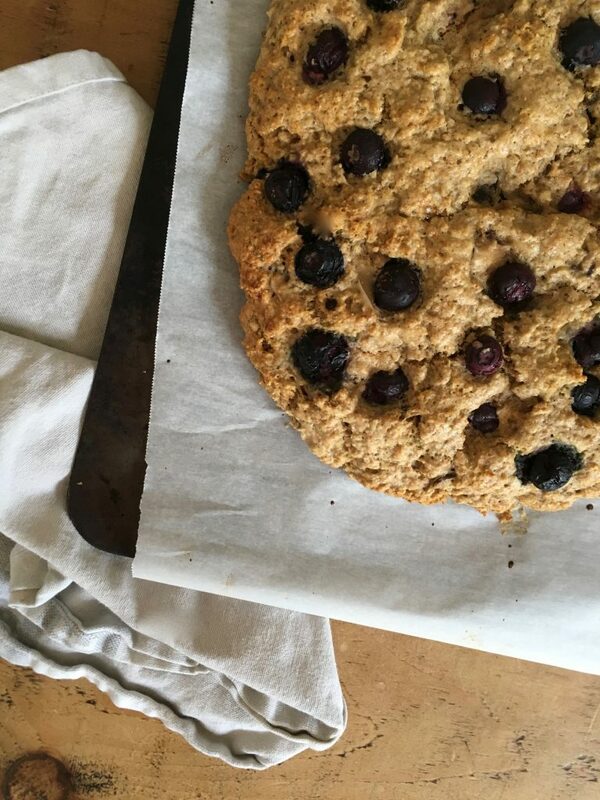 Nino helped me to make the scones, pouring flour into the bowl, mashing banana and dotting on blueberries with intent precision until he realized that stuffing them into his mouth was a more rewarding use of his motor skills. 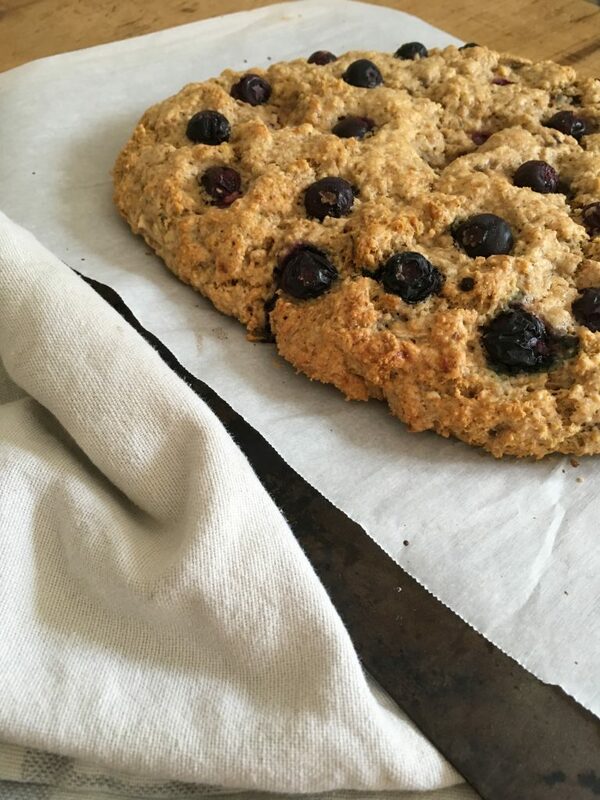 Where many recipes add honey or maple for ‘natural sweetness’, these scones are sweetened only by the fruit included. Wholemeal spelt flour adds a nuttiness to complement the butter and they’ve been a satisfying snack for all three of us over the past few days, with extras frozen for future tea time treats. Warm from the oven they need no addition but a smear of butter and jam or clotted cream and fresh fruit are both welcome additions. 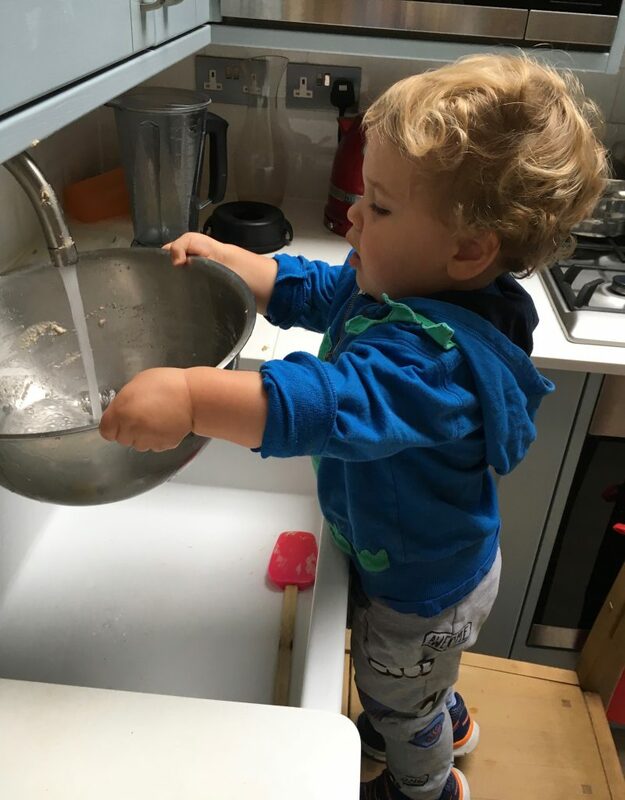 I’ve had quite a few questions from friends and on email about what I feed Nino, so I’m hoping to post more toddler (and family friendly) recipes in this space over the next few months. 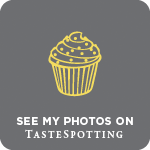 If there’s anything particular you’d like to see, let me know in the comments below. Crumbly, buttery scones made with wholesome ingredients from Vanessa Clarkson's wonderful cookbook, Real Food for Babies and Toddlers. 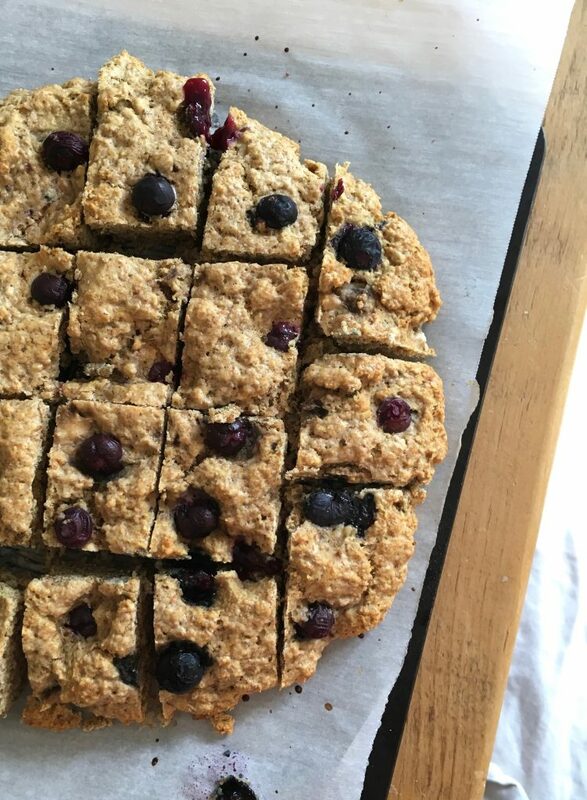 The only sweetness in these scones comes from banana and blueberries - we added a little more by replacing one of the lemons with juice and zest from a satsuma. Delicious served warm, they can easily be portioned up and frozen for tea time treat emergencies. Preheat the oven to 190 degrees C/170 C fan. Line a large baking tray with baking paper. Sift together the flours and bicarbonate of soda into a large bowl. Rub in the butter using your fingertips, until the mixture resembles fine breadcrumbs. Add the ground oats and mix until evenly distributed, then stir in the banana. In a separate bowl, beat together the egg, satsuma and lemon juices. Decant a quarter into a small bowl, add the zest and stir to make a glaze. Set aside. Add the yoghurt to the remaining egg mixture, beat until combined then fold into your dry ingredients, bringing together to form a soft dough. Turn out onto your prepared baking tray and press out to around 2cm thick. Dot the blueberries over the top, carefully pressing them in then use a pastry brush to glaze the top. It will look quite wet. Bake for 20 minutes until golden brown on top then slice into fingers or squares. Serve while still warm. I would like to know how i get my son to eat a single vegetable and a fruit other than banana 😉 We did the whole BLW and somehow after about the 18 month mark, foods slowly became rejected. However, these look very like something he might eat, so i’ll definitely be giving them a try. I know his younger sister would munch through them too, so if my picky 3 year old isn’t keen, it only means more for the rest of us. I’ll take that as a win. Oh my goodness, Nino is GORGEOUS. Those curls! My niece is expecting her first baby in November. Going to investigate the book that you recommend here. Omg, aside from the recipe sounding great (no added sugar! ), Nino is soooo adorable and oh my, that gorgeous hair! I initially skim read this as my two are older and I’m not so strict with no sugar these days. However! We have a camping trip planned in a couple of weeks and they are always ravenous on these so it struck me these could be a great no junk filler for those moments. Thank you!